Zeer stevige CD uit 1993 met pure rock'n'roll-songs afgewisseld met pakkende ballades (in het geval van Full Moon, Dirty Hearts zéker luisteren naar het duet met Chrissie Hynde). Deze CD bevestigt hun status als populairste band down under met een nog steeds gestaag groeiende aanhang in Europa. 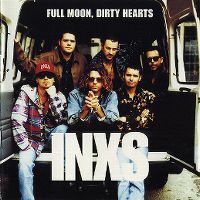 Voor INXS is Full Moon Dirty Hearts de 4de knappe CD op rij. Erschreckend deutlich, dass sie hier längst ihren Zenit überschritten hatten..
ich finde sie nicht schlecht. hat ein paar wirklich gute lieder darauf! A moody effort for INXS this time around with lots of different sounds. Michael's vocal is sublime on most track but I think the production let's alot of the tracks down. This album follows in a similar experimental nature as their previous album but in a less adventurous fashion. The band sound like there trying to keep up with the shifting music trends and sadly this effects the outcome of the album. As a whole it misses the mark, there is not one classic INXS track to be found. The highlights being "Full Moon, Dirty Hearts", "Please (You Got That...) " & "The Gift". For the most part this album is quite pedestrian in terms of quality song writing and production....yes there's a lot of energy from the group but it's just poorly executed. Self-indulgence has crept in...and it shows all too clearly. This is the groups weakest effort since their second album.